A greenhouse is not essential for growing vegetables, but if you want to grow a wide range of crops in reasonable quantities, it certainly makes life a lot easier. Buy the largest greenhouse you can afford and can fit easily into the garden. Make sure it has several opening vents, preferably on both the roof and at floor level. Later in the summer, adequate ventilation is essential and a through-draught is important. Stand the greenhouse frame on a solid base (e.g. 20-cm-deep concrete foundations). Leaving soil rather than concrete inside will make growing vegetables easier. When fitting the glass, try to ensure the entire greenhouse is airtight; any gaps will leak heat in winter. You will need at least one bench for seed raising and shelves for growing on seedlings. Ideally, benches and shelves should be removable to allow crops to be grown in the greenhouse borders during the summer. Run an electricity supply to the greenhouse but remember that unless you are a competent electrician, this is a job for a professional. Take great care where cables are run across the garden. They should be buried, or run under concrete, and connected to a residual current device in the house. Any sockets ii the greenhouse should be waterproof. You can now run a heated propagator, which is essential for starting off tender seeds, and an electric fan heater for background heat. 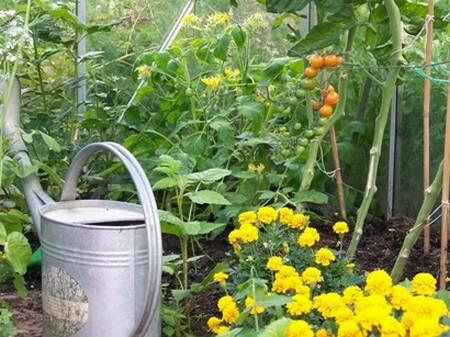 To grow vegetables throughout the winter, you will need to keep the greenhouse frost-free. The best way to do this is by using a thermostatically controlled electric fan heater to provide background heating. If you do not have electricity, use a bottled propane heater. These are cleaner to run than paraffin heaters, and some can be thermostatically controlled. Set the heater to about 3°C to ensure the greenhouse is kept frost-free. If you use the greenhouse mainly from spring onwards for seed raising, you can screen off part of it with a curtain of bubble polythene and heat only that area. An electric propagator will not be able to maintain a suitable temperature if the ambient temperature in the greenhouse drops on cold nights. So provide some background heat and/or insulate the propagator on the coldest nights. Fix bubble polythene insulation material to the greenhouse frame to help reduce heat loss. Drape a piece over the door and, if possible, run it across the roof space at head height to reduce the area to be heated. Start to remove the insulation material from the south side of the greenhouse in late spring to allow maximum light in. The best place to grow greenhouse vegetables is in a soil border rather than on a bench. This gives them more headroom, which is particularly important for cordon tomatoes, and makes watering easier. The border soil should be enriched with a mulch of garden compost or well-rotted manure each spring. Rather than grow the same crop in the border year after year, alternate unrelated crops, such as tomatoes and cucumbers, between borders. This will help prevent the build­up of soil diseases. If you notice a fall in yield and the plants look unhealthy, you may need to switch to growing them in large pots or growing bags. Growing bags contain a cheap and sterile growing media — usually peat, or a peat-free mix based on coir or bark. The flat shape of the growing bag means they dry out very rapidly in late summer and will need to be watered at least twice a day. Large pots are easier to keep watered than growing bags because of the greater depth of compost. Fill pots with multipurpose compost or the contents of a growing bag. Use a pot with a capacity of at least 10 litres, preferably more. 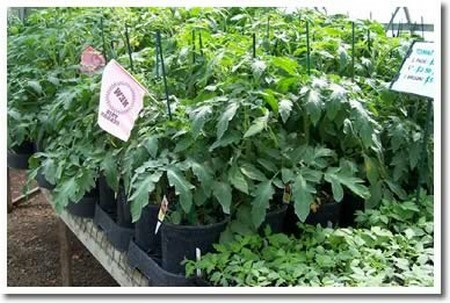 Both large pots and growing bags contain enough nutrients to support a vigorous plant (such as a tomato plant) for about four weeks from planting out, but after that, use a liquid tomato feed. Basic watering systems comprise a reservoir and tubing that trickles water into the pots or growing bags. More sophisticated systems are attached to a garden tap and feed water to plants via a network of thin tubing and adjustable nozzles. Some fine tuning will be necessary to ensure that each plant receives the right amount of water. Such watering systems can be completely automated with the addition of a timer or water computer. This means that even if you go away, the greenhouse will be watered each day. Clear out the greenhouse once a year, in late autumn or winter, and clean it thoroughly. Scrub the frame and glass (including the gaps between the glass sheets) with a greenhouse disinfectant or hot soapy water to remove algae and grime. Cleaning ensures plenty of light reaches the crops but also removes overwintering pests inside. Clean and disinfect all pots and trays used for raising seedlings, as well as the propagator and benches. Do this during the winter before the busy spring period. If you start the seeds in clean conditions you reduce the risk of damping-off disease. This fungus strikes vulnerable seedlings, which then fall over, often in patches. If you can catch the disease early enough, watering with a solution of a copper-based fungicide such as Cheshunt Compound should prevent it spreading to healthy seedlings. Other problems that affect greenhouse crops, such as aphids, spider mites and whitefly, can be effectively dealt with by using biological controls.